What's the Hidden Meaning Behind Lyrics of IU's 'BBIBBI'? Sulli quoted IU's lyrics on her Instagram post. Netizens are assuming that parts of IU's lyrics were written based on IU and Sulli's friendship. On October 11, Sulli posted a teaser clip of her upcoming reality show Jilli Store. Along with the video, she added a caption, "You get along with that girl who has a lot of rumors? ", which is a line taken from the lyrics of IU's recent release, BBIBBI. Considering the fact that the two girls are closely acquainted, fans are speculating that the 'girl' in IU's lyrics refers to Sulli. 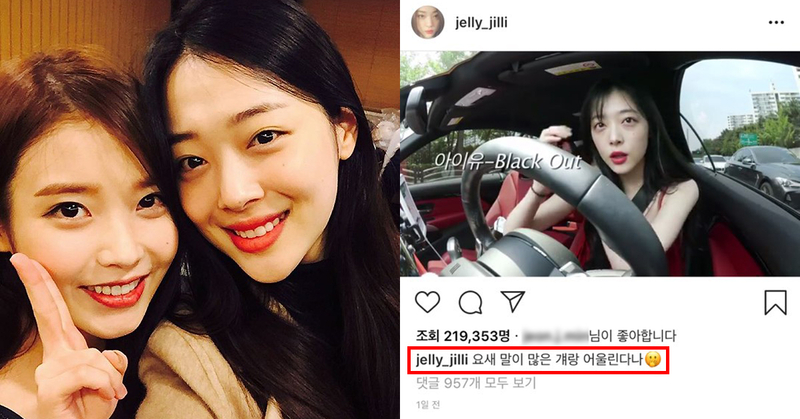 Sulli has been in the center of attention several times, for the pictures on her social media and romance rumors, and many netizens had been telling IU to stay away from a friend who has such a lot of gossips around her. Meanwhile, the song BBIBBI, which was released in celebration of IU's 10th anniversary, contains a message of warning to the public who backbites IU. It is receiving much support from her fans as it reveals IU's firm belief that she will not lose herself because of people who try to harm her.